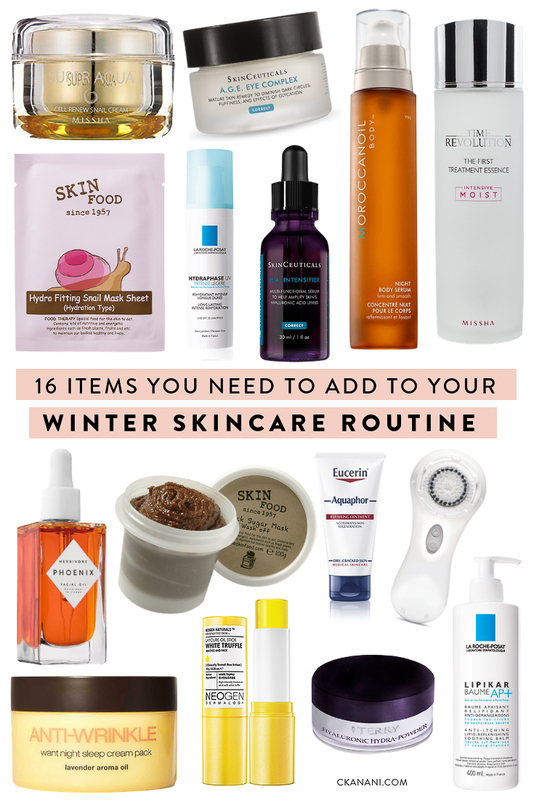 It is undeniable that winter can have an incredibly negative effect on your skin. The cold air outside negatively impacts it, indoor heaters negatively impact it, basically all things winter negatively impact it! Thanks to advanced skincare, though, none of that should be a major concern as long as you plan for it properly. I have the incredible luxury of having dry skin year-round (yayyyyy). That mixed with my large skincare obsession means I am testing out products to combat these issues 365 days a year. 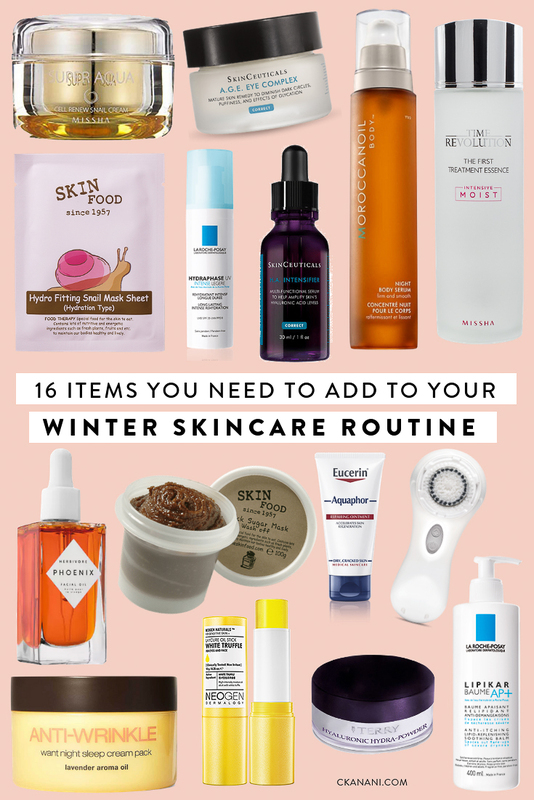 So based on that, here are sixteen items that I highly recommend you add to your winter skincare routine! MANY ITEMS BELOW ARE FROM SOKO GLAM. GET 20% OFF YOUR FIRST ORDER HERE! SkinCeuticals Hyaluronic Acid Intensifier is a powerful face serum that deeply hydrates the skin and one of my favorite products of all time! SkinCeuticals is really the creme de la creme of skincare and when it comes to hydration this is the best thing they’ve got. Its blend of pure hyaluronic acid, licorice root and more work to boost skin's hyaluronic acid levels, improving skin texture and restoring elasticity. La Roche-Posay Hydraphase Intense UV SPF 20 is my ride or die daily face SPF, especially in the wintertime because it is SO hydrating. if you aren’t familiar, La Roche-Posay is a France-based brand and comes recommended by 25,000 dermatologists worldwide! I too am a huge fan. This Hydraphase Intense lotion is extremely moisturizing, contains SPF, is small enough for a TSA-approved carry-on, and is in a plastic bottle which makes it very convenient for travel. I have recommended it to many people over the years and the raves are unanimous! Missha Super Aqua Cell Renew Snail Cream is a hydrating cream containing 70% snail mucin extract, something you likely hear me rave about often on Instagram! Snail mucin is snail slime extract (really) and is a very common ingredient in k-beauty! It’s incredibly moisturizing (it naturally contains hyaluronic acid, my favorite skincare ingredient ever), evens out your skin tone, and is even anti-aging. My roommate and I both recently started using this and we cannot get enough of it. It has a gel-like consistency and absorbs quickly, leaving your skin plump and hydrated. Herbivore Phoenix Cell Regenerating Facial Oil﻿ was recommended to me on Instagram what felt like 100 times after I asked what everyone’s favorite face oil was. My own mom and sister use it as well. It’s a hydrating facial oil that leaves skin with a soft, silky, and renewed appearance, and it’s clean! Missha Time Revolution First Treatment Essence Intensive Moist is an incredibly hydrating Korean beauty essence. If you aren’t familiar with essences, they are what you would get if a toner (the good Korean kind, not the horrible American kind) and a serum had a baby. They hydrate and aid in cell turnover. This one in particular is the #1 seller on Sokoglam, my favorite place to buy all things k-beauty. It contains fermented yeast extract that delivers vitamins, amino acids, and minerals to refresh, renew, and rejuvenate the outer layer of the skin. You can spray it on before makeup OR throughout the day over your makeup for another round of hydration. Skinfood Hydro Fitting Snail Mask Sheet is my current #1 obsession. I love sheet masks and these are only $13 for FIVE which is incredibly cheap. Inexpensive often doesn’t equal good but in this case it does! It’s drenched in snail mucin, aiding in healing, firming skin, encouraging cell regeneration, and replenishing moisture. I have bought them at least five times already. Anti-Wrinkle Sleep Cream Pack﻿ is a face mask you apply before bed and sleep with on. It’s made of fermented argan oil and lavender oil which will instantly nourish dry and aging skin. Lavender oil before bed of course also helps you sleep, too! I can’t believe how soft this makes my skin feel almost instantly, and even more so when I wake up in the morning. Highly recommend! Neogen White Truffle Laycure Oil Stick is a non-messy stick oil (what?!) that you have likely heard me mention many times on Instagram. I carry it in my bag 24/7. It can be used on your under eyes in addition to elsewhere on your face and is full of nourishing vitamin B.
SkinCeuticals A.G.E. Eye Complex is another year-round ride or die of mine. I have tried countless eye creams and never loved any until I discovered my beloved SkinCeuticals A.G.E. Eye Complex. It is the #1 best selling eye cream on Dermstore.com and for good reason! Since it is ultra-nourishing, it is especially great for winter if you aren’t overly dry like I am all year. Unlike other brands, it really does what it says it does — providing both immediately AND long-term anti-aging benefits (dramatically improving dark circles and puffiness, moisturizing and nourishing, boosting elasticity and skin thickness, diminishing the appearance of fine lines, wrinkles and crow's feet). Skinfood Black Sugar Wash-Off Face Mask is a hydrating exfoliant that can also be used as a mask. Exfoliation is especially important during winter because your skin is drier, flakier, and needs assistance in removing the dead skin. As someone with dry skin I have tons of exfoliants but with this one ringing it at just $10 (!!!) it is my highest recommendation. And unlike many exfoliants, it will leave you feeling hydrated instead of dry. Your skin will never feel smoother than it does after this! Clarisonic Mia Smart Sonic Cleansing Face Brush comes to this list by demand of my dermatologist. She insists that you use a Clarisonic every morning and night, and while I don’t do it quite that much, I will admit it does make a huge difference. Frank Body Coconut Coffee Scrub is something you’ve probably seen in Instagram ads. But unlike most excessively advertised-by-Instagram-model things, this one is great! Exfoliation is important for your body in addition to your face and this is your best bet for that. The coconut one in particular is incredibly hydrating — perfect for winter! La Roche-Posay Lipikar Balm AP+ Body Cream for Extra Dry Skin is the most moisturizing body cream I’ve ever found! Only buy this if you have incredibly dry skin, though. It’s also great for eczema. Moroccanoil Night Body Serum is a night serum that is truly luxurious and wonderful! Moroccanoil sent it to me to try out and I almost wish they hadn’t because now I want an unlimited stock of it for the rest of my life. It’s a great thing to have on hand for nights your skin is especially dry or ones where you just want to treat yourself to extra smoothing and firming. By Terry Hyaluronic Hydra-Powder﻿ is technically not skincare but makeup and I haven’t tried this yet but it blows my mind. It is a powder that contains hyaluronic acid. A powder! I can’t even believe it. Most of the reviews start with “best powder ever” so it’s at the top of my list for when my current powders run out. Aquaphor Advanced Therapy Healing Ointment Skin Protectant is certainly not the most glamorous of products, but there really is nothing else comparable when it comes to keeping your lips moisturized IMO. Other products will temporarily moisturize, sure, but this is the only thing I’ve found that truly moisturizes deep down. You can also use it on cuts, scrapes and burns, as well as to moisturize extremely dry skin, hands and feet, and more. I carry this with me everywhere.